Nikola One Electric Semi-Truck – Game-Changer or Pipe Dream? Nikola One Hydrogen Semi-Truck – Game-Changer or Pipe Dream? The centerpiece of Nikola Motor Co.’s ambitious vision of zero-emission trucking is its Nikola One all-electric semi-truck, but the key is the nationwide support infrastructure that the Salt Lake City start-up plans to build around the sleek new vehicle. The electric semi-truck, unveiled last week, relies largely on an uncommon power source: a hydrogen fuel cell bolstered by lithium-ion batteries. To sustain the vehicle through cross-country treks, drivers need access to fueling stations along the way. But fuel cell technology has never been attempted at such a long-haul scale. No such nationwide matrix of stations exists. If successfully implemented, it could be a game-changer for a clean-freight future. Hydrogen fuel cells are a no-combustion technology that require a constant source of fuel and oxygen to create electricity and emit only water. Since the concept first emerged in the 1800s, fuel cells have helped provide energy to laptops, generators and even NASA equipment. As a component in vehicles, they’re attracting more interest. This fall, General Motors and the U.S. Army unveiled the Chevrolet Colorado ZH2, an off-road vehicle running on a hydrogen fuel cell. In 2014, Hyundai launched its commercial crossover Tucson compact SUV with a fuel cell while Toyota debuted its fuel cell Mirai sedan. At warehouses across North America, Walmart uses thousands of forklifts equipped with GenDrive fuel cells from Plug Power. Last year, the California Energy Commission approved $2.4 million in grants to go toward freight-size hybrid fuel cell trucks to transport cargo at the Long Beach and Los Angeles ports. Loop Energy will start offering fuel cells as range extenders for heavy-duty electric transport vehicles next year. For truckers, electric vehicles will make up just 1 percent of the market by 2020, rising to 10 percent a decade later, according to IHS Markit. Nikola Motor’s plan “would certainly be the biggest deployment of the fuel cell technology” to date, said Dave Cooke, senior vehicles analyst at the Union of Concerned Scientists. The technology is “very appealing” to Andrew Mitchell, chief executive of an entirely emissions-free courier freight and third-party logistics service in British Columbia. A Nikola One would help his company — Geazone Eco-Courier of Victoria — diversify, Mitchell said. Currently, the fleet includes five Nissan Leafs, two Smith Electric 5-ton trucks, two electric cargo tricycles and a BYD electric semi-truck arriving in January. “It’s going to take a number of years to integrate, but I’m all for it,” he said of fuel cell technology. But for the Nikola One to work, it needs a vast network of hydrogen fueling stations — infrastructure that at the moment is essentially nonexistent. The U.S. Department of Energy counts only 50 retail hydrogen fueling locations by the end of the year, with most in California and focused on passenger vehicles. Meanwhile, there are more than 1,000 natural gas stations nationwide. Nikola plans to build hundreds of hydrogen fueling stations around North America over the next few years — the first will begin construction in early 2018 — while also launching facilities to produce the hydrogen that will be sold. The fueling stations will also be accessible to passenger cars. It is following in the footsteps of Tesla Motors. The electric car company has built its own nationwide charging network of 700 Supercharger stations for its customers. But Nikola will likely encounter hurdles as it works to finance and permit the stations. Much of the freight industry in the U.S. is perfectly satisfied with the existing diesel infrastructure. The country’s sprawling geography complicates the planning process. Building a network of stations in Europe, which is much more compact and open-minded about alternative fuels, would be easier, analysts said. Nikola, though, wants to win over North American customers. Its fuel dispensers, designed by Bennett Pump Company in Michigan, will be “something that looks, feels and functions like the traditional fueling dispensers we use every day,” said Bennett Senior Vice President James Collier. And although battery-electric vehicles have been around longer than their fuel cell brethren, they offer less range. Fueling often takes hours for a battery-electric rather than minutes for a fuel cell, according to a report from Navigant Research. Trevor Milton, founder and chief executive of Nikola Motor, originally planned to use a natural gas turbine to power the Nikola One but decided instead to go with the quieter, emissions-free fuel cell. The technology required less case-by-case calibration for a nearly identical production cost, he said. “For us, it was a no-brainer,” he said. Fuel cells are lighter than batteries and diesel engines — a key feature for big rigs whose weight is often blamed for ruining roads. The devices give truck designers more flexibility, allowing them to situate the lighter drivetrain behind the driver instead of in front, Cooke said. “It makes the vehicle more aerodynamic; gives it that ideal bullet shape,” he said. But long-haul trucking “seems like a surprising, maybe not the most appropriate application” for hydrogen fuel cells in part because of their added expense over diesel technology, said Lisa Jerram, a Navigant analyst. “As a long-term play, it makes sense for companies in the trucking space to be looking at alternatives, but my sense is that we’re pretty far off from this kind of fuel cell technology as something you’ll really see a lot of,” Jerram said. 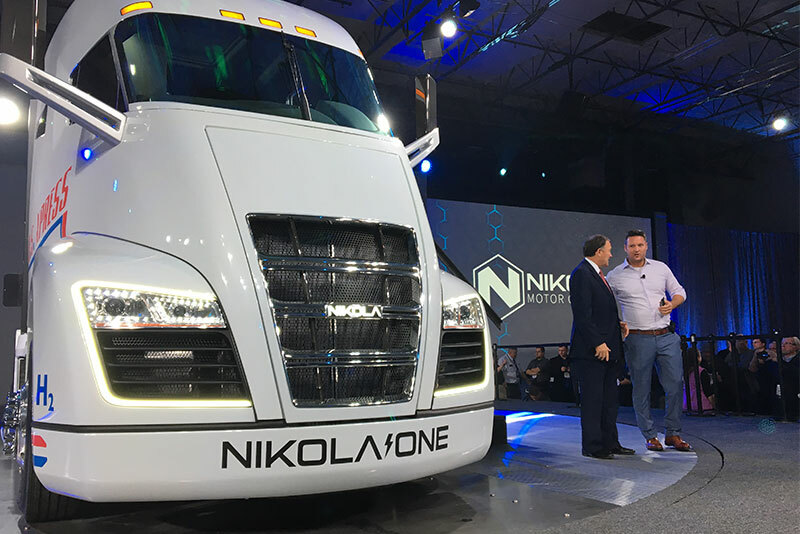 Nikola is trying to make an economic case for its trucking system by offering lease customers unlimited fuel. But many unknowns remain. Cost aside, some customers will be compelled to consider fuel cell vehicles and other alternative energy options simply because government regulators are starting to demand it. Heavy-duty rigs make up between 7 and 10 percent of vehicles on the road but consume more than 25 percent of the fuel, Cooke said. New Phase 2 greenhouse gas emissions standards from the Environmental Protection Agency, as well as a host of state and local rules, are attempting to chip away at the dominance of fossil fuels in trucking. Many manufacturers see a market opportunity. Nikola may be unique in going the fuel cell route, but it still must compete against larger rivals such as Daimler, Mack, BYD and Tesla, all of which plan to develop electric trucks. Hydrogen fuel cell trucking has the best chance in my opinion because it includes the big oil guys. They have the money and infrastructure to convert to hydrogen production without starting from scratch like other players. Big oil controls all the industrialized nations governments which create the regulations which dictates who wins or loses in the next transportation dynamic. How much would it cost to put 200 hydroogen pumps, spaced maybe 100 miles apart, along I 80 or I 40? There is your challenge. I meant, 200 hydrogen pumps. Is there a line of truck stops that would participate? Then you go to both costal routes, like LA to SF, NYC to Boston then to Miami. Bid investment, capable of getting huge government funding if you can demonstrate one working section. Wal Mart or something like it running its own fleet to its distribution system with pumps at the warehouses might do that. have got one on pre order. Being a new trucking company it will be a great fit. Hope it will become a reality. 65 mph up 6% grade. Stan Meyer created a car that ran on water on the road in 1984. Sold technology to the federal government and the next day had a heart attack and died. If you believe that. This technology can’t be smothered forever. It will be on the market soon as your willing to stand up for it and quit being a complainer. Sounds interesting, but so many unanswered questions. Not yet seen a detailed analysis of its economics, but in theory should be better value, as is Tesla. I think the cross over will come when major oil giants start putting hydrogen across their networks just as they are starting to do with electric charging. If any government can do it California can, but obviously they need to see a solid business case first, which I an not sure Nikola has produced yet.